Victory day, also known as Armed Forces Day, is celebrated on 30 August every year in Turkey. On this day, Turkish commemorate the victory on the battle of Dumlupınar. The battle of Dulmunpinar is the decisive battle for the Turkish War of Independence in 1922. One of the biggest reasons for celebrating the Victory day is to honor the founder of Turkey, Mustafa Kemal Atatürk. Following the defeat of the Ottoman Empire, Allied forces took over Turkey at the end of the World War 1. Then, General Mustafa Kamal and others started the Turkish war of independence, in 1919. Later on, after many efforts and sacrifices on the battle of Dumulpinar, Turkish army got victory and liberty. However, Allied forces did not leave Turkey until autumn, 1922; 30 August 1922 is accepted as the victory day of Turkish Army. The Turkish republic was proclaimed on 29 October 1923, in the new capital of Ankara. Markedly, Mustafa Kemal Atatürk became the first president of Turkey after the 1923’s war of Independence. Victory day is celebrated across the whole country and north of Cyprus, too. In fact, it is the celebration of Turkish military and the Turkish Republic. In addition, the main celebration is held in Atatürk’s Mausoleum in Ankara. Moreover, a ceremony is also held at the War Academy in Istanbul. 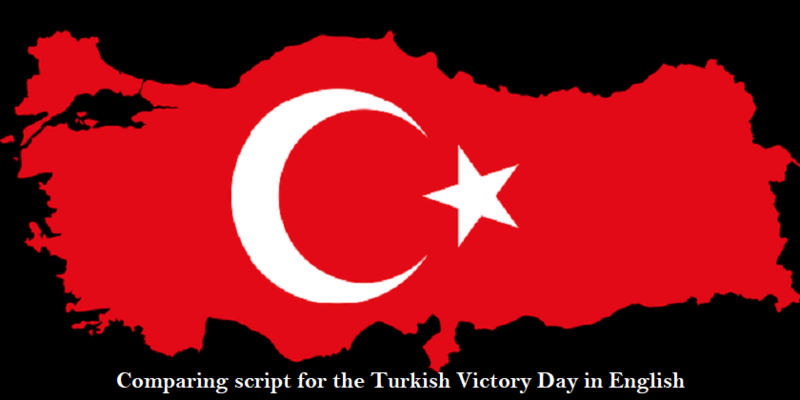 If you are also preparing for the Victory day celebration at your school, the article below covers the Comparing Script for the Turkish Victory Day in English. Anchor 1: Hello and Günaydın, Turkey. We hope everybody is feeling good. Today, we all have gathered here to celebrate the battle of independence of 1922’s victory, Zafer Bayramı and solute the great Mustafa Kemal Atatürk and those who participated in this league. Anchor 1: With that being said, I on behalf of (name of the 2nd speaker), respected principle and the entire school family, welcome you all, ladies and gentlemen and dear students. Anchor 1: Freedom in mind, faith in the words, pride in our hearts, and memories in our souls, let’s stand up for the national anthem and solute those noblemen who made it possible to once again breath in the air steeped with liberty. Anchor 2: Thank you, ladies and gentlemen. Anchor 1: I see dance being used as communication between body and soul, to express what is so profound to find for words, because it is the hidden language of the soul. Moving forwards, we would call upon our little fairies on the stage to welcome you all by their mesmerizing dance performance. Anchor 2: Wow, it was an outstanding performance. So, a round of applause for them, please. Anchor 2: Freedom is never more than one generation away from extinction. We didn’t pass it to our children in the bloodstream. It must be fought for, protected, and handed on for them to do the same. So, we request (name of the speaker) to come here and spread some awareness about the struggle of 1922’s independence. Anchor 1: Thank you, (name of the speaker). Anchor 2: Real life is so messy and drama is the shaped version of life. Therefore, the drama is very important in life. You have to come on with a bang. You never want to with a whimper. For some entertainment, our students have prepared a drama. To call them upon the stage, put your hands together, everyone. Anchor 1: Thank you, everyone. It was really an amazing performance. Anchor 2: It is time to bother the person who is the real reason behind our institute’s success. He is none other than Mr. (name of the principle). Sir, please. Anchor 1: Ladies and gentlemen, it is time to end this beautiful ceremony. We wish you all a very happy Victory Day and health, prosperity, happiness, and peace. I hope it was helpful for you. Please, feel free to share your views in the comment section below.